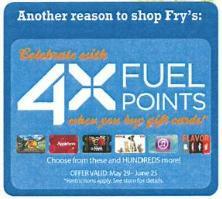 From May 29 through June 25, earn 4x Fuel Points when you buy gift cards! Unlike the Mother’s Day offer, it looks like all cards may be included this time. This entry was posted in Reward Programs, Uncategorized by mlemon317. Bookmark the permalink.